Nobody accuses the writer who is restless with the pen and a blank page of trying find her contentment in the wrong place. Is the singer who changes the arrangement, the pianist who craves the keys, the painter who tweaks the canvas, the collector searching for that one last treasure, the songwriter who paces the floor waiting for the perfect words, are they looking for meaning and contentment in all the wrong places simply based on what they are passionate about? Is it about time they smartened up and stopped wasting their time? No one would dare accuse them of such. I think they are created to pursue their art. That was my "Aha!" moment. It made me think about myself and my own desire for a beautiful home. And how that may be interpreted as materialism or discontent. But it isn't. It's my form of art. 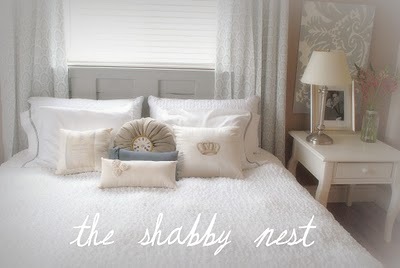 Like Nester, I have been interested in decorating spaces since I was a little girl. I talked my father into building a window seat for my bedroom. As a teen, I read decorating articles with interest, and incorporated ideas into my own room. When I moved into my college dorm, unable to choose furniture for the room, I went on the quest for the perfect bedspread and wall art. I put up a wallpaper border in my college apartment (no judging, it was the 90's!). It's just a part of who I am. I am in complete agreement with you about purchasing intentionally and about being intentional in the way we decorate our homes. I too have purchased things just because they were “cute” and "a good deal” and I figured I could use them at some point, or even because they were all the rage in blogland at that point in time. However, everything was put into sharp perspective for me when my husband was in a near fatal car accident this last summer. My job (which was a 6 year contract) also came to end at the same time. Here we were, in a precarious situation…with no income…living off what little retirement we had. There was absolutely no way in the world that I could go out and spend money on my home…whether the purchase was a good deal or not was irrelevant. And yet, I am a designer in my heart. It is my passion. It is my art. I felt an intense need, perhaps even moreso because of the tenuous nature of our situation, to create a home that was beautiful, comforting and nourishing to my soul. A place where my children were at home. The fact that I didn’t have any money to do that with was not a deterrent, it was a challenge. And so I set about arranging, and rearranging what we had. I learned that I didn’t have to purchase anything…good deal or not… to decorate a home. And I made a lovely home. And some people [may have thought that I was] spending money I didn’t have on decorating my home... And although I shouldn’t have needed to justify things, or explain that I hadn’t spent money on what I had done…I did justify it, I felt the need to vindicate myself... just as you said, sometimes those of us with decorating in our blood are deemed to be materialistic and superficial. I don’t believe that is the case. It certainly wasn’t my intention during that time. It isn’t my intention now. And there's the truth of it in a nutshell. I redecorate to nourish my soul. It is a passion. It is an art. I expect those around me to pursue their passions. I encourage them to hone their art. I hope that as we view all of the wonderful decorating projects that abound here in blogland, that we don't find ourselves thinking "Jeesh, she just redid that room!" or "Wasn't it good enough the way it was?" or worse yet "How much money is she spending on that?" Because, the truth is, behind the scenes in blogland, we never know what is going on. In my case, most of you knew about my husband's accident. But I certainly didn't make it common knowledge that I was out of work as well, and that we were living off of our retirement money. Part of my desire in decorating my home, and in sharing ideas with my readers, is to show that we don't have to spend money to make beautiful spaces. I try to do that with my home, because decorating is part of who I am. And redecorating is just a natural extension of that. It comforts me, it nourishes my soul. And so, my dear readers, I guess my point with all this is that I hope that we can appreciate the efforts of those whose decorating projects we see. That we can build them up. That we can believe that redoing that room for the millionth time might just be what that person needs to cope with the other things going on in their life. Thanks for coming here to visit my blog! I appreciate you all so much and am so grateful for my fabulous readers. You are more important to me than you realize!! I started decorating as a way to not feel so poor.We've never had a real vacation and can not afford to take them. It's nice for the home to feel like a mini vacation at times when everything has been renewed and refreshed.I believe the majority of us who has an obsession with decorating has a story behind it and that it is not materialistic. I agree 100% I have always said decorating is my hobby and it's what makes me happy. Someone elses's hobby is skiing - they spend money on lift tickets and equipment, spend time reading ski magazines, spend energy on the slopes. It is the same for me but I spend time/money/energy on home decorating and it's what I love to do and it makes me happy. This is a fabulous post! I too use decorating as a coping mechanism. I am quite frugal with my limited funds and altho they make look fabulous it doesn't mean I spent any money on it at all! I applaud you admitting you feel the need to justify yourself sometimes as I have in the past. If tweaking and working on a room until it is what your soul needs is a bad thing then there are a lot of us in trouble! Home is our refuge, our place in the world that says who we are and what we can do. I say three cheers to the bloggers who share with us their inspiration and ideas! I hope many people take this advice to heart today and realize it's a small portion of our world. Like you said so well, it may be just the thing to get us through a crisis the blog world doesn't need to hear about. Much love to you! i think women are often times nesters at heart. we love to have a lovely and practical environment for our loved ones. i feel that keeping it clutter free and tidy is a way to bless them ( & me too) whether they realize it or not. That was THE BEST post I have read about this passion of ours. It is hard to decribe, hard to understand, impossible to "justify." This post says it all and so incredibly susinctly. It's actually beautiful. Does that sound weird? Don't care if it does :). Because it is so often tied to money, big or not, it is easy for others to see it as materialistic and malcontent. And we know it's not. I've had this conversation with my husband for years. I think he finally gets it. But, I'm going to email this to him. I consider myself pretty good with words, but I couldn't have written something better to send to him. Thanks, and I know you, even though we've never met. Thanks you so much for posting your thoughts on decorating, and the tweaking that inevitably ensues. I also have thought, am I materialistic? As these wonderfully put thoughts reveal I can now rest a little easier and know, I am not. I remember thinking about my future home when I was as young as 7. It just started and I wiled away endless hours thinking about my future home. I also did a lot of walking back and forth to school. I didn't mind, no matter the weather, as it gave my time to look at every single house along the way, admiring the many features of the varying styles of homes in our neighborhood. The only difference is that now I have money from time to time to implement my ideas. I continue to spend many hours looking at decorating magazines and blogs admiring what others have done and finding wonderful inspiration. Makes me feel alive. Best regards and thanks again for your thoughtful post. This is a fantastic post! One I will likely elaborate on in the future on my blog. My husband has expressed to me his own perseption of my being discontent because of the redecorating on a regular basis and I never thought to compare it those other types of passions for art. Thank you so much for posting this. I agree with you 100%. I get self conscious that people think I am selfish and materialistic because I like to make my home pretty. But's it's not that at all; it's just a passion of mine, it relaxes me and makes me happy. And I am happiest when I can come home to a place that truly reflects me after a long day at work. Thanks for this! wow, what a wonderful post today! i also love to change things up and have been concerned that others would think me materialistic also...i love how you said it 'nutures' your soul...ahh, love that! Amen sister! Thank you for putting to words what so many have felt and didn't know how to express it. I feel like I am never done decorating. I hardly finish a room before I'm tweaking it again. It isn't because I'm discontent and certainly has nothing to do with materialism. I get a bigger trill from being thrifty, but it is about how it makes me feel inside. It's about accomplishment. It's about expression. I am not musically talented or athletic. Decorating is what I'm good at. It's where I shine. Does a singer sing the same song over and over again? No. Your comment about building up other bloggers, even though we've seen them tweak their rooms for the millionth time, really hit home for me. I think I HAVE done my living room and my dining room a million time, and I probably will again. I'm glad that you share your passion with us. Thank you. I just have to say thank you for this post, and tell you how much I can relate! Often times, I put myself on a guilt trip for wanting to continuously "tweak" our home! Lately, I've had to do it with what I already have, as our financial situation has changed as well. I think this is true for much of our country. But thanks to you, and so many others in "blogland", I have been given so many ideas to help me in my quest of redecorating without spending! I'm so grateful that I have a hubby is is extremely supportive and recognizes this as my art. I am a Child Forensic Interviewer, which is a very emotionally taxing job. Decorating and creating is a way for me to escape after a long day at work. It is also a way to create a safe and beautiful haven for my own family. My only fear is that my hubby and children will end up covered in decoupage or glitter...I've warned them not to stay still for any length of time...! Thank you again so much...I needed this today! GOD BLESS! Hugs! Wendy, this was such a thoughtful post. I think a lot of people find a great sense of satisfaction that they can make a comfortable and attractive space for those they love, that they have the ability to do this with their creativity and own two hands. Decorating one's home is a creative pursuit and you are right, it's much like an artist's honing of his or her gift. You have a gift for creating a beautiful home and sharing your ideas with others, and your need to be thrifty makes it all the more challenging and interesting! One of the sweetest words is "home." And why shouldn't it be everything you want to make it? I went through a period where I rearranged my bedroom furniture every day until I found a way I loved. My mother would just shake her head and walk by (I was about 15), but knew it was futile to question me. One of my favorite movies has a quote in it that I love to dust off and present to people who don't understand why certain things must be a certain way. Y'know the flick Empire Records? In one scene, the artist of the group is gluing quarters to the floor. Later, an apprehended shoplifter is trying to pick them up and says "What'd you glue these down for?" and he responds with "I don't feel the need to explain my art to you." Exactly how I feel. I do have a burning question--how did you ever convince your dad to build a window seat? I tried for YEARS and got nowhere. I just found this post via Twitter and I'm so glad! So much truth here, and in Nester's piece (which I must have missed on its first go-round). I wrote a guest post (not yet posted) late last night and it's so eerily similar to your words here. Some of our take-aways may be slightly different, but the heart is the same. Follow your art, Girl. This is just beautiful. Exactly. Love this post. Creating, Decorating nourishes my soul and has got me through some rough times. I've only just realized how much I need it. That is why I am so glad I have found my people in blog land. People who get it. Thanks! My oldest daughter often asks why I continue to re-decorate and re-organize our home. We don't get a lot of company and those who do visit love me whether our house is clean and organized or not. Thank you for your post. Now I can explain once again - I do it for me!!! It's my passion, my way of relaxing & my way of expressing myself. There are many times when the family is asleep & I get that crazy urge to change all my accessories around. They wake up to a completely different house. I love to see how many others are like me. I'm not crazy, I'm just passionate. I relate to you on so many levels. I am going to save this post so when I feel I need to "justify" why I do what I do I can use YOUR words to explain myself! Thanks so much. It's hard for me to justify my desire to have a beautiful home to my husband. All he sees is me buying things. And my problem is that I want my house to look like my favorite picture right now so I want to get all the things right now. I have trouble being patient with a work in progress. And I have trouble figuring out how to fulfill my vision for our home with the stuff we already have that I'm not too fond of. i'm a homemaker and mom so what else am i supposed to do if i can't.. make my home? Yes this is me! I literally just took a break and sat down at my computer after rearranging my office for the 75th time. I am so happy I have a patient husband that never knows what is is going to walk into when he gets home from work. Great post. I agree and was just thinking about this concept. It's art for me... It's also on the job training so I can do better for clients. I think I feel inspired to write a post about the topic myself. Thanks! Thank you for posting this. I know this about myself but sometimes I think other people probably think I'm crazy. Or discontent, or obsessed, or whatever. I need to forget what other people think and remind myself, God made me who I am, I love to create and make things beautiful, just like my Creator! :) Thank you again from speaking from your heart! Great post! I think you hit the nail on the head for most of us. I can totally relate. You just said it much better than I could have. Thanks! 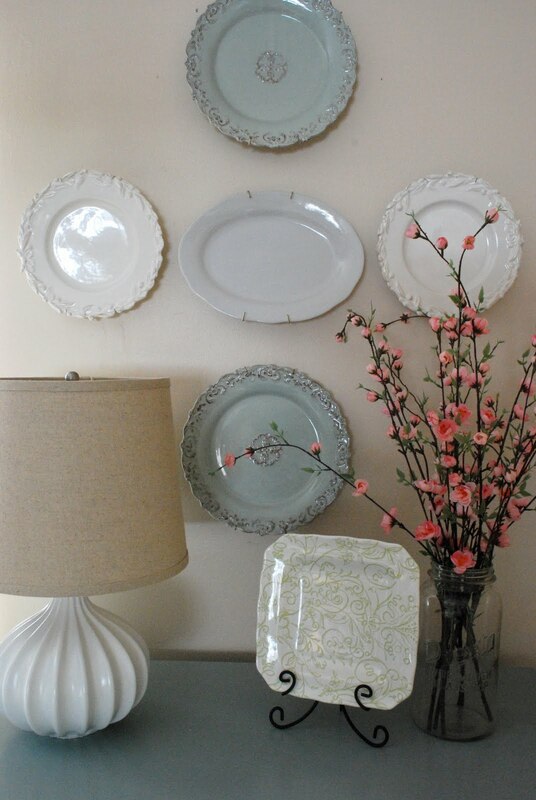 I have one of those blue flower plates that is on your wall. Such a great find. It is so decorative. This is an absolutely wonderful post and gives me much to think about. I must admit to viewing some blogs and seeing the continuing purchases and wondering when is it enough. However your point that decorating is a form creativity is valid and one I hadn't thought of before. That being said, I have a room full of craft supplies that I don't use everyday but I know that if I have the urge/need to create to fill my soul, I have those resources available to me for which I'm very grateful. I crochet, sew, paint, illustrate, make cards, refashion clothes....you decorate you house, where is the difference? I can't see one now. Thank you for helping me to see what I should have seen all along. And I try to understand those who have zero decorating urges as well.My sister is BIG into exercise, which leaves me...meh, and I love to decorate, which does NOTHING for her. Thank you so much for putting this subject into perspective for me. As an interior decorating on the side, I find people (including my husband at times) thinks that because I always rearrange or change out to different things, as my passions change, that I am never satisfied and see it as a materialism thing when they say "I'm just not like that with my home". This has helped me put my passion into words and can relate it to my husband, since he is an artist. It helps me to also realize it IS my art, that's why my passion is so large for it. Thank you again for your beautiful, but powerful words. What a great post. I agree with every word you wrote. Decorating my home truly feeds my soul. I am an ever evolving person as is my decorating. Of course it makes sense that the decorating can't stay stagnant when I am always growing and changing. Decorating is truly one of my biggest passions. It's so nice to "meet" someone who feels the same way I do. We as bloggers should always encourage each other whether it is in redecorating, writting, fixing food, picture taking or whatever we are passionate about. And you know what? It really isn't anyones business what we do with our passion. Your post is excellant! Thank you so much, what an absolutely beautiful post. It was only recently that I actually decided to allow myself to start spending money on decorating my home. Previously, I hadn't really allowed myself to, because it was so much more sensible to put the money towards the mortgage. We didn't NEED extra stuff to make the house liveable, but it sure makes it a nicer place to be. My husband and I are now renovating an old house, and have had to move out of it to do so. We're camping out in a tiny bedroom in my brother-in-law's house until we're allowed to move back to ours, and now more than ever I've realised the importance of 'home' being a place that you love to be. A place that cheers you up, relaxes you, and gives you joy. Can't wait to get back into my own house, because I really don't love where we're staying at the moment! And can't wait to add the little touches that really make a place feel beautiful and comforting. Plus on the positive side, improving one's home is a pretty great hobby! Considering all of the expensive hobbies out there, the fact that we've chosen to direct our energy towards making our home beautiful and comfortable helps everyone! Thank you again, you've given me permission to view decorating as an art, not an excuse to spend money on unnecessaries. As all the women before me have stated this post is wonderful and is probably one of my all-time favorite. When it comes to decorating my home I do so to create an environment where all who enter feel welcomed and at home. To make your surroundings pleasing to eye is not being materialistic at all, it is simply showing pride of ownership. I re-posted on my FB business page. This could not have been written more beautifully!!! Wow, loving the comments on this page!! I did post my own thoughts on this on my blog this morning if anyone wants to stop by - it's very much inspired by this post by Wendy. Thanks again, Wendy. I just so totally agree, you never know what's going on in someone else's life. I'm glad you find your joy in decorating ... I do too :) Keep sharing, because we love what you do. Thank you for this post! I responded the exact same way to the same passage the Nester wrote--and I am so glad you are keeping that conversation going and lending it even more validity. Thanks! Who knew these craft blogs could be so deep lol! I agree with you and the Nester both. I think I might go insane if I couldn't express my creative side in some way. I actually have several ways that I do it and it makes me happy and sometimes it makes others around me happy as well! Wow! I have had a crazy week and haven't visited any of my favorite blogs until tonight and so was catching up on all your posts and have to tell you this one was incredible!!!!! Thank you so much for posting this! I couldn't agree with you more. transportation, and beloved pet) in the hurricane Katrina. You then understand household things aren't important but yet they have their importance..and that is to bring some joy and happiness in your life at the moment. I have learned no matter where you live or what you live in making a "home" gives a sense of specialness for the family you love. I am also a visual artist so I understand never being satisfied with your work, always striving for the higher. But isn't that what life is...the process of living not just the result. Don't EVER feel guilty or need to explain your passion....live it honestly. Bless you! I love this post. Sometimes it seems like I am discontented because my home is "stuck" between what I am trying to achieve in my mind and what I actually have to work with. However, I stress a little less now because I can enjoy the journey. I can laugh when my husband comes home to the 4th furniture arrangement in a week (giant TVs are great and all, but they sure can kill the ambiance of a sitting room). I've been this way since I was a little girl. My Dad would wake up to my sixty pound self trying to push a full-sized bed across the room 4 inches at a time trying not to make noise at 1 am on a school night! Decorating is in my DNA, and I love it. I have an eye for detail that doesn't stop, and I love to create with what I have; even if no one else notices my springtime vignette on the console, I get to enjoy it every time I walk by! Thank you for putting into words what has escaped me, but has been in my heart. Beautifully written!